Since the newest camera in Fujifilm’s lineup, the X-T1, has already been compared in terms of specifications to the flagship X-Pro1 model, it seems only fair to finish this marathon of comparisons by seeing how it measures up against a model positioned slightly lower in the range. That is, of course, the Fujifilm X-E2 – arguably the best camera overall in the Fujifilm’s range, at least until X-T1 showed up. Naturally, the X-T1, being newer, packs the latest technology, but the X-E2 isn’t exactly old and, considering that $300 price difference, is a serious rival for the higher-end model. 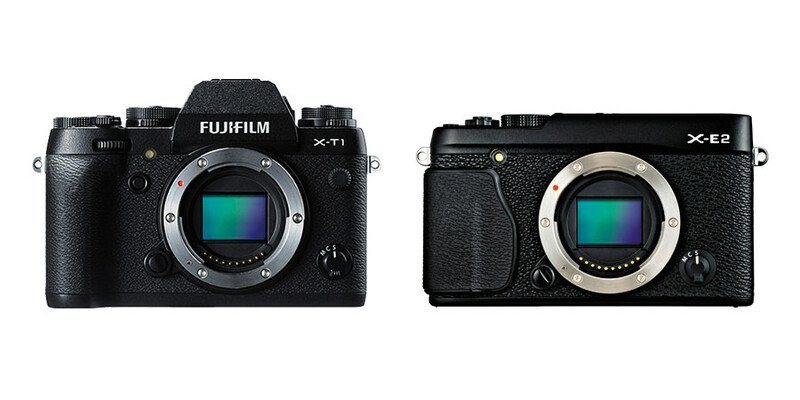 The Fujifilm X-T1 and X-E2 are as remarkably similar as X-T1 and X-Pro1 were different. You could almost say the X-T1 is an X-E2 at heart, but with a few notable differences. First of all, they share the exact same APS-C X-Trans CMOS II sensor and EXR II processor. Courtesy of that processor both cameras also feature Fuji’s Lens Modulation Optimizer, which is basically a set of software enhancements that counter diffraction effect in JPEG capture mode when the lens is stopped down. There is also the now-standard hybrid autofocus system with both phase- and contrast-detect sensors. As we’ve found in our X-E2 review, the system is indeed very capable and swift in good light. I would be very surprised if the X-T1 was somehow worse in this regard. Video recording is exactly the same with 1080p60 capture available. They use the same batteries, have EVFs and 3″ LCD screens with the same resolution, both feature the ever-important diopter adjustment, ISO and shutter speed range as well as flash sync speed. Size and Weight: the difference here is not striking, but the X-E2 is still noticeably more compact due to the lack of an EVF “prism” bump at the top and the more prominent hand grip. It is also lighter by nearly 100g, so will be a better choice for those who want the smaller package. X-T1’s slightly bigger dimensions have an advantage of their own (more on which later), nonetheless it is undeniably the chunkier camera of the two. Pop-up flash: personally, I do not find the pop-up flash to be such a useful feature with most serious cameras. I’ve never used one to light a subject directly with my Nikon gear (but have used it to control external SB-900 speedlights). Still, for those rare occasions and those who know how to take advantage of such light creatively (think fashion photography) the inclusion of a pop-up flash in the X-E2 will be an advantage. Threaded shutter release: because of all the weather sealing (presumably), X-T1 loses the threaded shutter release button and, consequently, support for old and cheap remote release cords. Price: X-E2 is $300 less expensive than the bigger X-T1 model and that is quite a difference. In fact, X-T1 is currently the most expensive camera in Fujifilm’s entire compact camera system. At the same time it will deliver the exact same image quality, is more compact and overall extremely similar to its pricier relative. This is by far X-E2’s biggest strength when compared to the DSLR-like Fujifilm X-T1. There’s not much, I agree, but that only serves to emphasize just how much the two cameras are alike and capable. Something that is hardest to ignore, yet also difficult to define as a definite advantage for either camera, is the design and, consequently, ergonomics differences between the two. The X-E2 takes after the rest of Fuji’s rangefinder-styled mirrorless cameras with a minimalist design and tiny grip. Even though it sports a high-resolution EVF, there is no hump, so you can’t really tell there is in fact an EVF when looking at the front of the camera. Fujifilm X-T1, on the other hand, looks much more like Fujica film SLR cameras of old with an added grip that’s not as prominent as on modern DSLRs, yet still quite a bit more so than on the rest of Fujifilm’s mirrorless cameras. In this regard, X-T1 seems to be trying to lure in some die-hard DSLR users by seemingly offering all the advantages of a compact camera system, yet also as true-to-life EVF as it currently gets as a substitute for the missing TTL OVF. It looks very purposeful, I must say. EVF: this is X-T1’s party piece. Yes, it has the same resolution as the X-E2’s EVF which already is hardly shabby. Quite the contrary, in fact – it is one of the best in the market. Still, Fujifilm has managed to improve it further with the X-T1. The new EVF currently offers the biggest magnification of any DSLR or mirrorless camera on the market today – a whopping 0.77x! That’s bigger than that of the full-frame Nikon D4. I did not find the official magnification specs for X-E2’s viewfinder, but I know it is somewhere in between 0.60x-0.64x (full-frame equivalent). Perhaps just as importantly, the lag has been reduced to a barely noticeable (at least in theory) 0.005s. That, too, is very impressive and should be a welcome improvement for the EVF-skeptics among us. I will say this again – X-E2 is very good already in this respect, but if you absolutely need what might be the best EVF ever fitted to a compact system camera, X-T1 could be your choice between these two. Ergonomics: so, the X-E2 is smaller and lighter. That might be a very good thing if you use small, light prime lenses and do not tire carrying the camera around. If, however, you tend to shoot longer, heavier lenses (and several such lenses are coming), X-T1’s more prominent hand grip will make it easier to handle. Because of that grip it has the potential of being much more comfortable to hold for longer periods of time. There are also more external controls with programmable buttons and dials for ISO, metering modes and shooting modes. This means you’ll be spending less time browsing the menus, and who likes doing that? Also worth mentioning is that X-T1 has lockable ISO and shutter speed dials, so you won’t accidentally rotate them to a different position and affect your exposure. Speed: not a huge difference, but the X-T1 can shoot at a maximum 8 frames per second (with continuous AF, by the way) versus 7 fps of the X-E2. Build Quality: the body of X-T1 is made of magnesium alloy, top to bottom. X-E2 is built from a mixture of plastic and magnesium alloy parts, so its build quality is slightly inferior. Articulated LCD: let’s face it, the fixed LCD of the X-E2 will be advantageous to very few even though I mentioned it as a possibility. An articulated screen is likely to be more useful for more people. Worst case scenario – it is neither an advantage nor a disadvantage when compared to a fixed screen, because no on is forcing you to tilt it if you don’t need to. I think it is safe to say that the choice between X-T1 and X-E2 is quite a simple one. All you need to do to decide is ask yourself several questions: do you prefer the compact dimensions of the X-E2 or the potential comfort and abundance of external controls of the X-T1? Do you need extensive weather sealing? Do you absolutely need that huge EVF with minimal lag? If you shoot moving subject a lot, you might. If you’re coming from a DSLR and are skeptical about EVFs in general, it will leave a better impression, too. For many, though, X-E2 is already good enough. Finally, is it all worth an extra $300 for you? Answering these questions will give you a clear idea on which camera to purchase because, in the end, they both are the best Fujifilm can offer at the moment. Overall, I think that the price difference reflects specification differences very accurately. good article that summarizes my feelings: my XE2 is good enough for me and represents a maximum size I’d want a mirrorless camera to me. After all, the whole idea of mirrorless when it started was the reduced size, right? Otherwise we could all keep using our existing DSLRs. if the size is the same as DSLR, DSLR has more advantages to me, from optical viewfinder to real phase AF that actually can track my child who runs nonstop in every direction. Thus when they keep increasing the size of mirrorless, addition protrusions such as a viewfinder hump…they are moving away from the main idea behind mirrorless – small size and weight. Out of all mirrorless cameras I’ve owned, the most comfortable one in my hand is Panasonic G5. It is very small yet has a real grip but small enough to fit in my pocket with a pancake lens. That is the optimal size for me. A friend has the xt1 and suggested I look at it. You make a good point. why get a “big” mirrorless? I sold my nikon stuff because i wanted small…thannks for the point! Nice comparison Romanas! It’s nice to have these specs down to help choose between the two cameras. A couple of things I would say. Although they are probably only software differences, the X-T1 is meant to have “predictive” AF tracking, which is meant to be a bigger improvement over the X-E2. The other difference, is what can be done with Wi-Fi. The X-T1’s iOS app software allows the user to remote control the camera from an iOS device, where as on the X-E2 this is limited to just file copying. I hope Fujifilms are considering to bump up the shutle speed to 1/8000 & flash syn speed higher. 1. Internal Flash – sorry, but the Fuji flash is surprisingly good to have there always available, especially for fill-in where it really shines and in low light situation – mix and match – as per X-E1. I would like to oppologize to you for my last rant and rave. that seemed to fuel a bit of outrage among your respectable whatever’s… We all seem to want the same thing. A piece that makes sence and a tool that we can mAke familiar to our hands for quick adjustments and so forth. I want to clear the air with why I was so… Verbal before. I believe the manufacturers of our beloved camera gear bleed out as much profit as they can by making cameras that aren’t worthy of the hard earned dollars that we consumers she’ll out. I also believe that some of these reports or so called reviews are nothing more than advertisements created to sell these sub par pieces of plastic/aluminum/glass/rubber and other things. You had a poster that was concerned with children reading these articles while I spewed out vulgar words. I agree totally with this person and I apologize to the children as well as that concerned adult. But let me address the children that are so interested in photography that read these articles and posts with diligence. Do not believe everything you read. You will often times find yourselves spending your hard earned dollars (in the future) on things because someone tells you it’s ok to do so. You’ll be told that nothing is better. You’ll be told that you will be a better you if you only purchase these things. But, don’t listen, it’s all what we grown ups call.. Hype or better yet.. Lies. L get back to the adult side, I personally love taking pictures. I’ve shot many things. For fun. For money. For whatever. I understand cameras very well. I own too much crap and I’ll buy more. The thing that I get upset over is this exact thing. You’re comparing two different looking prices that are the same thing. As if they are different? Are you being paid to do this by Fuji? Who cares? These pieces are nothing more than a trendy looking 16 mpixel point and shoot that make the owner “feel” cool. You know it, I know it. The reason I get upset is that you portray these as credible cameras. The y are a grand! $$$$ a thousand dollars!! One is a little less and one is a little more. They are ultimately the same piece and they make the same I games by the same crappy photographers. Or the same images by great photographers. Perhaps a low-cost pinhole camera is what you’re looking for? are you accusing me of trying to sell Fujifilm cameras to our readers, because you think Fujifilm is payingus to do so? :) Or are you trying to say that all I or Nasim care about is gear? Before you answer that, let me just give you a side note – I am a person who owns an old Nikon D700 camera and loves his cheapskate, small, light, simple 50mm lens more than any other he’s ever used. Think on that a little. As far as Fujifilm goes, for me, it is exactly what you said you wanted in a camera. It’s honest and simple. I love the lenses. I like that they are not holding back and trying to improve products even after they are discontinued and replaced by newer models. The X-Pro1 now is genuinely better than it was at launch. And you are accusing them of trying to “milk” all the cash out of their customers that they possibly can? Sorry. You are not making much sense. If anything, they try to make even the old cameras relevant for longer periods of time. Sorry. I do not really have anything else to say. You just seem to hate the idea of new cameras regardless whether they bring something to the table or do not. I have nothing against Fujifilm so far. Fuji, in my humble opinion, is the most honest manufacturer today and their cameras are far from being “retro idiot boxes”. I would shoot a wedding with any of the top three cameras in their range, gladly. And I let my work speak for me. I do, however, feel very strongly about product updates that are not real product updates. Yet somehow hating all the new cameras and shouting about that all manufacturers are “milking” their customers, sorry, that’s at the very least a little ignorant. Similar to saying “everything is wrong in the world and should be different”. What is everything? Different how? Empty words. It’s just not true. To Karl Schroeder, your point of view is very controversial. Let’s clarify it: what you pretend is to pay for parts and labor when you buy a camera. I would like to do so with a camera, a computer a car, but doing so (as you pretend) we still would be using daguerrotypes, driving Ford T cars and having IBM XT computers. Where do you think incentives for a better product comes from? Short answer: profit. Of couse manufacturers try to get maximum profit, but they have stockholders asking for it and a RD department. When you buy any technologically upgradable item you are paying in part RD of a new product, RD of the product you are buying and in a lesser degree parts. In Fuji particular case RD means a lot, they don’t have the sales volume of either Nikon or Canon. I have a personal stand, if price fits my pocket my needs and my likes I would buy it. if I consider it overpriced or I have a better alternative I would skip it. Anyway these days with 1000 dollars you are in the cheaper side. Please if you are looking for a “camera that kicks it into tomorrow” think of a higher price otherwise you would be dissappointed. Romanis, thanks for the excellent write up. Really helps my decision making. Good job nailing the issues. Karl, your remarks are of no value in this discussion. I was wondering. I wear glasses, just like you Romanas. I’d say that the EVF makes it worthwhile. What’s your take on that, Romanas? Tim, in this case, both cameras have diopter adjustment, so it is not really an issue. If you want as good an EVF as you can get, the X-T1 is better. Not because the X-E2 is somehow bad, but the X-T1 is simply better still. So if that is high on your list of priorities, the EVF alone might be worth the extra three hundred bucks for you. There’s decent eye relief, too (23mm, I think), so you should be able to shoot even with glasses on comfortably. I was wondering about the eye relief on these 2 cameras; in the past, Nikon “high eyepoint” viewfinders (like the F3hp) achieved greater eye relief by having lower magnification. If it’s 23mm on the X-T1 though, that’s better than most cameras. Perhaps the EVF makes this easier to achieve (vs. optical finder). Brian, I do still think it to be a good idea to practically see for yourself whether the EVF/OVF is comfortable with glasses or not. That eye relief is just a guideline, really. will the predictive af in X T1 make a difference with moving subjects. Is this a firmware update thingy which we can expect to implement in X e 2 in the future ? Great article and, as well, I have enjoyed so much of your work on this website. My question is this: regarding the eyepiece of the XE 2, can one use it while one is wearing glasses? I do wear glasses and have quite a strong prescription. I would be surprised if the diopter adjustment could accommodate my vision. I ask this because I am considering buying an XE-2. I have owned many Nikon film cameras and currently use a D7000 comfortably with my glasses. Many thanks. Diopter correction ranges from -4 to +2, which is a broader range than that of the D7000 by a small margin. If that is not enough for you, I do think you would have no trouble using the EVF with glasses on, as the eye point is approximately 23mm (versus the shorter 19.5mm of the Nikon). I doubt you’d have any trouble with it, but if you feel anxious about it, just go to a retail store where they sell the X-E2 and simply try it out! Dear Romanas: Many thanks for your response. If only it were as easy as going to a retail store and sampling the XE-2. I live in a rural part of the U.S., and we have no camera store or any store in a several hundred mile radius that carries the X system cameras. On the other hand, if the eye point on the XE-2 is greater than that on the D7000, I could reasonably conclude that I could use the viewfinder with glasses on the XE-2 easily, since I have no problem doing that on the D7000. Thanks for the information! You could rent one for a few days from someone like lensrentals.com if you’re willing to pay the money to try it; also I hear that some people buy gear then return it if they don’t like it, although that seems a little shady to me. I’m worried about shot-to-shot time lag. Having AF/MF blocked, my NEX-7 performs here as a DSLR does, It shots as fast as my finger press the button again (until the buffer is full). How does the X-T1 behaves at this point? I’m thinking about changing to Fujifilm and this is very important for me to have a responsive and snappy reaction from the camera, specially for not missing a expression when sooting portraits. I’ve tried the X-E1 and it’s a little bit frustrating because it’s not fast enough. Juan, I will ask Nasim to get back to you on this one. He’s used the X-E2 extensively and loved it. Since the X-T1 should be at least as responsive, maybe his input will be of more use to you. Thank you Romanas, I’ll wait for Nasim answer. As you said X-T1 should perform equal or better than X-E2. Juan, I will have the X-T1 here in a week or two – I will let you know! I expect the lag to be better on the X-T1 compared to X-E2, since it is supposed to be “the camera” from Fuji for shooting action. hope Fuji has rid of “laggy” cameras with this X-T1. I’ll wait for your test. Romanas thank you very much! As I read the first post here, I thought ‘oh just another new toy’. But then I read more and more and got some interesting informations. But the best of all what I saw was amazing to me: The high-iso images at imaging-ressource (google the comparometer). I compared especially the high iso-images (800-6400) with the Nikon D4, Nikon D800 (I know that this is not fair and these are not the competitors, but my IQ-reference cams), D610, D7000, D7100, Coolpix A and Olympus OM-D M1. Okay, the X-T1 is not better in IQ than a D4 or D800E (resampled to 16 MP), but with a smaller sensor, smaller body and lower price very near by them. Forget the D610, the D7100 or the OM-D M1 or all others. I am really really impressed about the image quality of the X-T1! My D800E and all lenses I own from Nikon are really good. But I just wanted a smaller second camera and nothing was there that really could satisfy me. Nikon 1? Coolpix A (I own one but, it is slow, often to wide and no built in viewfinder). And now with X-T1 there it is all what I wanted and I will own one soon and will buy the both very attractive 23 mm f 1.4 and 56 mm f 1.2 too. Welcome my first Fuji, I hope we’ll be good friends! Romanas, your articles are not only useful, they are sometimes amusing – like the last one about Hasselblads Lunacy. Thanks a lot and go on so! I tried to use my X-E2 in Yellowstone NP last week and it kept locking-up in the cold 10 degree weather. I just took out the battery and then reinstalled it and it worked ok until it locked-up again in 5 minutes. 10F is technically below operating range (32F). But it may depend on your situation. I’ve had my Fujis out doing astrophotography in 20-30F weather for hours with no problem. Wayne, none of the Fuji cameras, except for the X-T1 are supposed to be used in such cold environments – they are not weather resistant or sealed. I expect the X-T1 to be much better in that regard. Once I have it, I will shoot it in extreme cold and let you know how it behaves. It is 2 PM and the outside temperature right now is 1F, so if it stays this way for a week or two, it will be a good test for any camera! I don’t understand the low temp limits on these cameras. The electronics shouldn’t be affected unless it were very cold, so cold that it would be dangerous for people to be outside even with extreme winter gear. In fact, cold should lower sensor noise a little. The only thing I can see as a problem would be condensation when returning to a warm, humid place — the weatherproofing might help, but it would be best to put gear in a sealed plastic bag or other container until it warms up. Nasim, do you have any idea what would cause problems like Wayne wrote about in his comment above? Hi Brian, I’m not familiar with the specific components of these cameras, but while the sensor may benefit from lower temperatures (I don’t know that for a fact), the many different components that make up the cameras (or any electronic devices) that *consumers* use may not hold up well in extreme temperatures. They could expand, contract, (in size), struggle, or simply fail at temperature ranges outside of what the manufacturer designed the product for. I’m talking about the plastic circuit boards, wires, solder, capacitors, resistors, plastic for some body parts, metal for the mounts, screws, fasteners etc. So, (hopefully) manufacturers use the correspondingly-graded components when they say that their products will work at specific temperatures. Gerry, you’re right about the rated temperature range of components, I should have realized that. But I think that is more about meeting specifications than outright failure, certainly in resistors but also other components. Expansion and contraction would be concerns, but now that I think about it, the one component that I would expect to have the most trouble would be the shutter, i.e. the remaining mechanical component in a mirrorless camera. Brian, in my experience, meeting specifications means that the components should work as intended; I consider failure to mean that something has kicked the bucket (as in: “my hard drive finally failed… time for a new one.”). But that’s just how I interpret those terms. One of the strong points of X-T1 camera is that you can use an iPhone to control it and shoot via the Remote App. Unless I am mistaken, the X-E2 does not allow remote control via WiFi, in which case this would be a substantial and important difference. I guess that smartphone remote control makes the camera ideal for selfies. I expect X-E2 to gain such functionality via firmware update sometime in the future. So, is the Fuji X-T1 going to replace the Fuji X-Pro, or will there be an X-Pro 2 coming out? I would get that camera. Is this like an in-between camera of the X-E2 and X-Pro 1? Anyone know? The X-Pro2 will probably not be available until 2015, possible announcement late 2014. The X-T1 is for a slightly different market and is meant to be in between the X-E2 and X-Pro’s. That’s what I thought, but had to ask. Thanks. Another hands-off review/spec rehash of gear you’ve never touched. … the point of which was to compare specifications. You are very observant! A largely pointless exercise but then saying very little at great length is about all you do in pieces like this one. Oh, it proves to show how nice a person you are saying this article was somehow pointless after a few people have already thanked us for putting the specs on one page and writing a short overview. Thank you! It was useful to some, but if you say it is pointless, it must be pointless. Thank you for letting all these nice ladies and gentlemen know, what would we do without you? On a slightly different note, yes, we have been doing rather a lot of technical articles lately, so critique where it’s due. But then we are also trying to get back on track with actual photography. I do feel obligated to remind you, as you obviously forgot, that you are in no way forced to read something you do not like. Photography Life is not a place for nameless internet trolls, cgw, try and remember that. There are plenty of other websites for that sort of behavior. Forgive me for sinking to your level. Sometimes I feel fed up with experts on what’s pointless and what’s not, such as yourself. Have a very nice day, cgw. Just try for some substance sometime beyond recycled press releases. I ‘m guessing you can do better? Maybe not. BTW, where’s your coverage of the possibility of a class action suit in the US against Nikon over their handling of the D600 fiasco? That’s relevant. Grow up. And how is the D600 fiasco relevant in this thread? Why are you so trollish of posts on a forum you don’t need to be on? I’m starting to think you run a forum or some unsuccessful rubbish of your own and go around the internet riddiculing other people’s work. Maybe thats why you don’t use your real name. You call that relevant? Alright. Firstly, that’s even further away from actual photography than this article. Much further. Secondly, everyone’s fed up with talking about D600… for months now. And we are, too. Very much so. Good bye, cgw. I don’t mind talking to our readers, but this truly is a waste of time. Sorry but most of the “writing” on PL is just so laughably pompous and derivative. Hopefully your new contributors recycle less and inform more. Again, you seem to mistake this website with some other. Must I repeat? We do not much appreciate trolls, cgw. Especially those that think we somehow owe them something. What we do takes a ton of time and effort on our part. What you do is show yourself in the worst way possible. Have a very good day now. Read – you are welcome not to trouble yourself with any of our pompous articles. CGW, please just leave the site and troll elsewhere. We do not welcome you here. I would be very interested in getting some more info about the split screen and the dual mode. For as far as I understand the dual mode, it is a second window with an magnification of the focus area. And it is restricted to the x-t1. Are you going to try some just manual, legacy lenses on it? Any experience about its usefulness? I suppose that only the bigger EVF, the party piece as you called it, allows the “squeezing in” of the second window. Any input is very welcome. I am currently trying out the x-t1 to see if I am going to switch to it from the x-e2. The evf is very large and the dual mode is restricted to only the x-t1. It is basically the same as the focus assist, but on the right side. I’m not sure how much I’ll use it as it shrinks the overall evf view, but does work well. There is a focus assist button as well if you only need it sometimes as its harder to switch back from the dual display as you have to go into the menus. For a long photo shoot the two displays would work well. For candid and other photography its perfectly fine to just hit the focus assist, check the focus and go back out. So now you have two ways of doing it vs only the one, before. Hope that helps. Hi Tomas, actually there’s no need to go into the menus to switch to the dual mode view. Just make sure the focus switch on front of the camera is in manual mode, then press the “DISP/BACK” button with your thumb to toggle among the three different EVF views: Full/Normal/Dual. One other nice thing I discovered yesterday is that you can program the AF-L button to work even when in manual focus mode — so the AF will quickly get you in the focus range then you can manually focus (to fine-tune or focus on whatever element you want). If you want the full manual focus experience then no problem… just don’t use or program the AF-L button to work. Of course, this only works with Fuji AF lenses but it was a nice surprise to find. Despite the web is full with details and reviews and videos of this new nice camera, there are a couple of things that are still obscure to me, and I would greatly appreciate if somebody could try it and let me (us?) know. I am considering this camera for something that I am doing often, that is self portraits. I am considering the X-T1 because I am attracted by its WiFi remote capability with iPhone and, for the same reason, I am comparing it to the EOS 6D that could otherwise look very different but is also controllable via WiFi. 1. once I have focused (on me, for instance), can I move away from the scene, before releasing the shutter, to fix other things in the scene, without the focus change? In other words, can I lock the focus once I have focused the lens, via WiFi? It would be useful for me to know that I can focus and then do other things and then come back to the scene and not have to re-focus. 2. I know that some mirrorless cameras (my Sony NEX-5, for instance) are horrible to use with studio flashes because the LCD only displays a dark image when selecting fast shutter speeds (e.g. 1/160) and small apertures, that are suitable for flash use but would obviously result in underexposure without. Now, I know that X-T1’s viewfinder is smarter and is ready for use with strobes – it lets you see a bright image even if you are looking at a scene that would be dark without strobes. My question is: does this work with the WiFi image too? Can I see a bright image on the iPhone if I am selecting shutter speed and aperture in view of strobe shooting? That’s it. I would really appreciate if a test and review of the camera could answer these two questions that to the best of my knowledge are unanswered so far on the web. I wanted to add one thing, still in rumor stage although it has been mentioned by Fuji, the X-E2 will be getting a firmware update very soon increasing the refresh rate of the EVF to match the X-T1. I’ve been borrowing an X-t1 and the improvement will be very welcome to my X-E2. i like how Fuji continues to improve their products along the way. A good idea to compare the cameras like you do. I have a Fujifilm X-E1 and I am pleased with it. However I find the autofocus a little bit slow and the lcd-screene “lowdotted.” I have considered the new X-T1, but without flash I dont know. It feels like the X-E2 is a more elaborated. The bad things are cured, so to speak. Am I right? Not long ago I ditched my Nikon gear and bought into Fujifilm (X-E2, precisely). I am more than pleased with the way my X-E2 performs. And I want to thank Nasim from the bottom of my heart for writing up his review on it, since it was only after reading his review that I decided to go for it. I have recently updated my X-E2 and the two XF lenses I have (18-55mm & 35mm). I have noticed focusing speed improvements on both the lenses, particulary on the 18-55mm but I guess primes can’t be expected to focus as fast. I have been trying to use the focus peaking feature after the recent update, now I get peaks in different colors, but I’m not sure if it’s just me or whether those peaks are quite often hard to spot. I think Sony A7 does a better job at focus peaking, I watched a video of someone using Leica lenses and the red highlights were making manual focus seem incredibly easy. I tried to achieve the same effect on my X-E2 but I find the peaks are just too thin. Can you please help me with this? Is there something I am not doing right? How about the AF-Performance with the latest firmware. Is the XE2 close to XT1? Especially when tracking moving subjects. I understand that the XT1 has the best AF but they seem to have the same processor so they could possible be Equal. Oh, I usually shoot 3fps, not faster. Am I the only one who is seeing a focus lock problem with the Fujifilm X series cameras (at least with the X-E2 and the X-T1)? I am NOT talking about the issue of needing to put the AF Mode switch in the front of the camera to M for the AF-L button to be functional that everyone is aware of. Of course I was NOT using AF-C mode and complain about focus change like an idiot either. I was in a Fujifilm showroom displaying most of their products somewhere in Asia yesterday. I spent about two and half hours trying out the X-T1 and the X-E2 and loved most features and ergonomics with the two cameras (image quality is a given that goes without saying). However, I realized a serious defect with both cameras. The focus lock actually DOES NOT lock focus very well, no matter which button you use to hold focus (shutter release on the top or AF-L on the back). No matter which lens I mated the cameras with (about four to five of them), after you think you’ve locked focus by the confirmation green light and the beep sound, you move your focus area away from the subject to re-frame for better composition like everybody normally would before taking a shot. The subject would be slightly out of focus (when it is not at the focus point at the time when the shutter release was pressed)! After I found out about this issue and asked the Fujifilm rep, he and his colleagues actually QUIETLY confirmed my finding. Both he and I were very curious why no one brought this matter up in the their review on the web. Now you understand why I withheld the exact location of this showroom earlier. Am I missing something? Did the reps and I do something wrong? Is there anybody else that has the same experience? If you do, how do you deal with it? I am on the verge of buying the entire X system as I like everything else so much. This focus problem is absolutely a deal breaker. Anybody in the know, please shed some light. Thank you. @Derek1: your post got me wondering about my X-T1 so I just checked what you’re describing with 23mm, 35mm, 56mm, and 55-200mm lenses on my X-T1 and no drift problems whatsoever. In regular AF mode, I use the usual “half-press the shutter button” then recompose. The focus *always* stays locked after I half-press the shutter button. I also set up the X-T1 so when I put the camera into “M” focus mode (the switch on the body), it’ll autofocus when pressing the “AF-L” button only and the shutter button only trips the shutter. So basically, I focus using the AF-L button, and when I let it (the AF-L button) go the focus always stays locked/where I left it. No drift at all in either AF or M mode. BTW, on some lenses (like the 23mm) there’s manual focus clutch so if you pull it back & engage the clutch you’ll be in manual focus mode no matter what mode you’ve selected on the camera body. Gerry, Thank you for your reply. Guess I will have to find other units verify this issue again to be sure. subscriber – derek , are you happy that your xt-1 does not drift on focus lock ? neither I nor Nasim noticed such issues with our X-E2’s/X-T1’s, and we use the focus-and-recompose almost all the time. Might have been an isolated issue.